I was interviewed by a Journalism student about social media and this is what I said. Why is it important to maintain good social media profiles? It is crucial to maintain a consistent social media profile that truly represents your business with high quality interesting & valuable content because in today’s media world your social media profile could well be the first point of contact for your prospective client. If your profile is inconsistent and lacking in providing your target audience with inspiring & entertaining content then they are likely to unfollow you on social media and not think positively towards your brand. I often talk about a Trust Tree. Every communication on social media is an opportunity for your ideal customer to be putting a leaf on their Trust Tree. The more touch points you have with them the quicker they can fill up their tree, the more stable your relationship is with them the more likely it is they are to have confidence in you & what you offer and therefore buy from you. Do you think they act as the modern version of CVs? If you are looking for employment then I believe a well crafted CV plus a smart, tidy & active LinkedIn profile is the perfect match. It’s also important to remember that your activity on other social media platforms will be taken into account! So always be mindful of what you say and do on social media. I once heard someone say ‘Don’t do anything that you’d be embarrassed for your Granny to see’! Tips on maintaining professional accounts? Know your target audience - really really well! Typically people say if you have a product based business then you should use visual platforms like Instagram & Pinterest. And if you have a service based business you should use platforms like Twitter & LinkedIn. It all comes down to knowing your customers - where do they go for information? What platforms do they use? Where are they most likely to buy from you? THIS is where you should be. How do you think social media can launch someone the career of their dreams? Social media can definitely be the key to launching someone’s dream career! I believe wholeheartedly in this, that’s what I’ve built my business on! Helping others set up, establish & successfully grow their dream business from nothing to something incredible where they are adding value to their clients lives on a daily basis and making an important and heartfelt contribution to their community. What makes an account stand out? Knowing your clients and speaking directly to them & involving them in your business, so they actively take part in the journey with you. What is your opinion on bloggers and their increasing number? I think it is marvellous that blogging as a career has become so accessible for people especially with its flexibility for working hours etc so ideal for parents, students & older generations. Although there is a feeling that it is becoming rather over saturated, but saying that I still see great value for small businesses to collaborate and team up with bloggers for reciprocal benefits. In the time it takes you to eat a sandwich, have a nice cup of tea and maybe a digestive (dunked or not, your choice!) you could have made some very significant changes to your LinkedIn profile which will definitely make you more appealing to your ideal clients and therefore generate increased enquiries and sales. So I put on the timer and did a dummy run through LinkedIn to see what improvements could be achieved within just 20 minutes. This is what is potentially feasible and if you’ve already completed some of these steps then congratulations you’ll be spending less than 20 minutes on your profile and still have made useful changes that will give you an advantageous position over your competitors. Profile photo. Choose a professional well lit headshot. I know this seems really quite obvious but you’d be surprised how people still choose to use holiday snaps or selfies with your girl/boyfriend(s). Background cover. Don’t leave the default blue dot-to-dot as your background! Choose an image to compliment your profile photo and that correctly represents you as a business professional. Tools like Canva are great for designing social media covers and they have a template for the LinkedIn cover. Ask for 5 recommendations from the last 5 clients you’ve worked with. And if you’re not connected with them on LinkedIn yet...why not!? Pop them a connection request with a personal note. I think that probably wraps up a very productive 20 minutes, don’t you think? If you’ve other suggestions on how to light up your LinkedIn profile in just 20 minutes, I’d love to hear from you. Please do get in touch. And if you’d like me to help you for more than 20 minutes then why not book a LinkedIn tutorial that is designed just for you and your business. It’s not ok to just be on Twitter. I often hear people say “I’m on Twitter” as if this ticks the Twitter box on their social media plan. Well I’ve news for you…. It’s not enough, it just won’t do! It’s like going to a party hoping to find a boy/girlfriend but not actually talking to anyone. Ok yes you went & maybe soneni might have noticed you and then maybe they decided to say hi or maybe not. Maybe they were more interested in those that approached them and therefore forgot about you. That’s quite a lot maybe’s, isn’t it? Attracting new business & being noticed by potential clients & collaborators is no different. It’s pretty similar to dating. And if it helps to make this comparison then do it! Twitter is the most misunderstood platform so us whatever analogy to understand it well & use it to its full potential. Imagine this scenario. You see a guy at a bar you’d like to get to know a little more shall we say. Which option do you think you’d get the best chance of getting his phone number? Completely ignore him. Remain talking within your circle of friends about things that interest you. Keep your fingers crossed that he’ll notice you. Be brave, approach him and start a conversation. Ask him questions about his interests. Listen to his answers, be genuine, honest & friendly. So please don’t just be ON Twitter, but DO Twitter. Start conversations, seek out other businesses to collaborate with, take time to build & nurture new relationships. All good relationships (business & personal) need energy, commitment, time & patience. This nurturing & growing stage is a whole other blog in itself! Remember Twitter as the dating stage. So get out there and start flirting! (professionally speaking of course). It is well known that I love running (I post pics of my pink trainers and places I’m running on social media quite a bit) and it is well known that I love social media (I am hugely passionate about unravelling the mysteries of social media for small businesses so they can benefit from this awesome online world). So let’s kick of with the first similarity. If you are new to running or you are returning to running after a break (like having a baby!) then yes it can be really hard and yes it can really hurt! But as they say there is no gain without pain. This is like social media, before you step into this apparently confusing rather baffling world of tags, hashtags, mentions, retweets, shares & other oddities you may feel some pain. This is in the form of resistance, uncertainty, fearing change & fearing the unknown. But do not fear. Because a) the pain is short lived & b) I can minimise the pain for you. If you think going out running in your local park for a quick jog once a fortnight is going to improve your fitness, stamina, endurance, health and so on then I’m sorry to tell you it isn’t! Well no that’s not exactly true, all exercise is good exercise but if you’re serious about running (read serious about your business) then you need to be training at least 3 times a week with a schedule to improve your fitness levels and challenge yourself. Ok so let’s translate this into social media terms: if you post on Facebook on a random basis, say once a fortnight like our jogger then you are not going to get anywhere near where you’d like to get with your social media. Likewise if you tweet occasionally and expect to gain new followers and engagement then you’ve got the wrong idea. So often clients say to me ‘I’m on Twitter, but I’m not getting any followers or RTs’ The key word is ON. That’s it they are on Twitter. Yes, but they are not DOING Twitter! Organise yourself a schedule to ensure you are CONSISTENT with your posts & tweets…. Little & often is the best strategy here. If your plan is to run a 5k within 3 months you’d need to start off running little and often, then build up the distance until you’re able to run 5k without stopping. No3: The results can be astonishing! I’ve heard so many people say how running has changed their lives and they’ve achieved a personal goal, maybe a new distance or PB or even a marathon when they never thought it would be possible. But they didn’t get there through an occasional spur of the moment run. OH NO! They got there through sheer hard work, dedication, training, commitment, perseverance & drive! Apply all these principles to your social media and you could be achieving incredible results too! I know its possible! Why? Because I’ve done it myself and I’ve helped clients do it too. 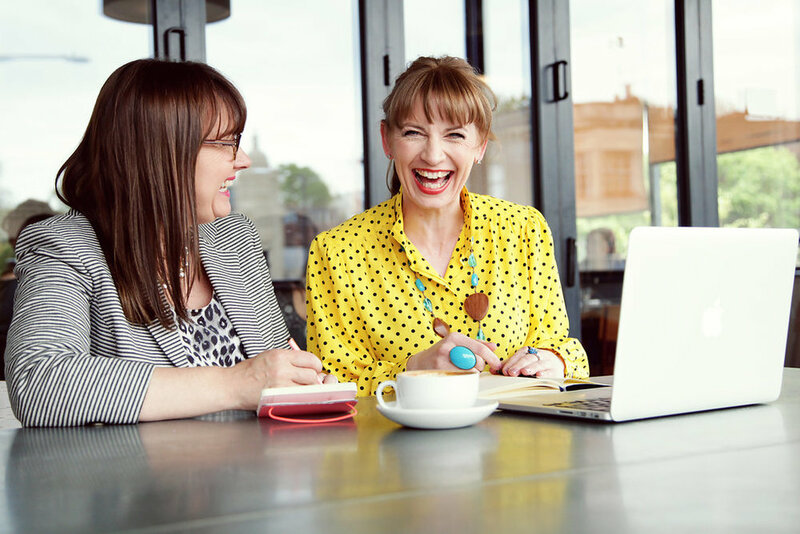 If you’d like to book in a complimentary social media strategy session where I can help you to see how you can achieve results with your business, then please click here & I look forward to helping you. You wouldn’t dream of letting passers by see your shop window display like this, would you? So why not give the same care and consideration for your online shop window? Your potential customers might find your business for the very first time on Social Media and their first impression of you (remember first impressions last!) is what they see on your Facebook page (I’m not talking about photos of your kids and you walking the dog! No, no I’m talking BUSINESS! Your Facebook Fanpage - although I’m not keen on this rather old fashioned term so lets call it your Business Page as opposed to your Personal Page). What people see when they land there is important, it’s VERY important! If it doesn’t look open, inviting, welcoming or friendly do you think they’ll stay? Do you think they’ll want to come in and browse or chat? Nope, I don’t think so either. You’ve probably got about 3 seconds to convince them that they DO want to stay and find out more about you and your business. 3 seconds… that’s not very long is it? So my question to you is if you were visiting your page, what would you think? Give yourself 3 seconds and then decide: Am I staying or am I going? Think. Like. Your. Customer. Firstly I must admit and come clean that I did not set myself a challenge to see if I could do it, a test of my willpower, but I was forced to do without! So how could I cope without internet access, email, Google, Pinterest, Facebook, Twitter…. shall I go on? The key tools that have become my trade, but also my friend. Yes that’s right I said my friend! How utterly bonkers is that? I think anyone who checks their newsfeed more than 5 times a day will be able to relate to this. It turns into a necessity that then becomes essential in every day life and then familiarity kicks in and your facebook feed feels like chatter with old friends. Comfortable, happy and reassuring. I know I’m going off tangent here as you wanted to know what I’ve learned about my no wi-fi time, but let me just add one more note to this: It may feel like natter with old friends but tell me this how many of your FB friends are your FRIENDS? I know how many of my 900+ are, and it’s not many! It’s not that I don’t value the other 850 friends – I do, I really do. But they play a different role to my ‘real-life’ friends. So after my confession that I did not set myself a challenge but rather we were on holiday where getting reliable wi-fi is like asking your children to play nicely together! It doesn’t happen often! I decided that with some pre-planning and a little help from my wonderful associate Emma (who took the reins at SHC while I was away and did a marvellous job too!) I’d go cold turkey for 7 days and nights and embrace the wi-fi free lifestyle. Number 1: There is more to life than facebook! (I’m talking about from a personal perspective of course, you mustn’t neglect FB for your business!) Life carries on in the real world – the here & now. So what would you rather spend your time doing, being in the moment right now or having your head stuck in your iphone? Number 2: My emotional health and wellbeing is more important. When my ‘screen time’ was taken away I did wonder what I’d do with myself! Well it didn’t take me long to make myself a list of all the things I wanted to do and I thoroughly enjoyed ticking each and everyone one off the list. They included: reading (& finishing) a book; going to bed before 10pm; waking up when my body was ready for the day (this ended up being 9am. I got bored! ); having a glass of wine in the bath; allowing myself time to think & reflect free from stresses; enjoy a leisurely lunch (instead of eating a sandwich in 2 minutes in front of my laptop); do nothing (without guilt); sit on the beach and watch the waves… for ages. Number 3: My children and my family are more important. Sorry if this seems very obvious but it it still needs to be said. This evening I saw a family of 3 generations all sat around a table together but all individually engrossed in their ipads and iphones. No conversation, no eye contact, no affection, no laughter. Each family member from the children to the grandparents might as well have been sat alone with just their device for company. So without the distractions of the web and my work I’ve spent quality time (yes I know its a cliche but it’s true!) with my daughter and my son. We’ve played card games for hours; dug big holes on the beach and buried our feet in the sand; played with toy animals in the bath until the children’s fingers went wrinkly. And the best bit of all… watching my children run in and out of the waves again and again with squeals of laughter!